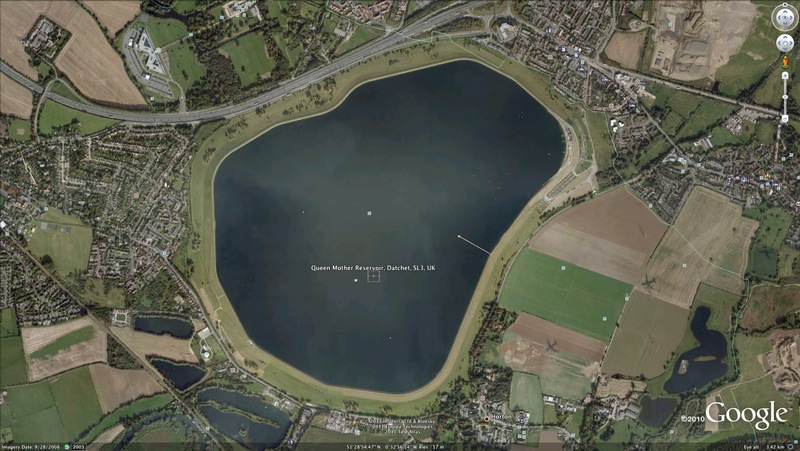 Results and race report as soon as they are available! 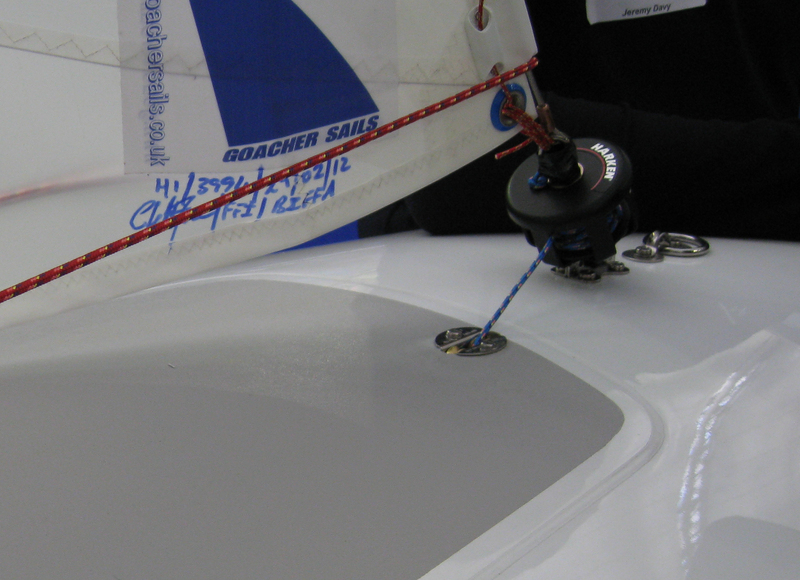 Dinghy Show – Inverted Mainsheet Jammer….!! Causing no end of interest at the Dinghy Show last weekend, was the custom inverted jammer that Phil Evans had made for Justin Waples’ new Ovington Fifteen. It was commented on by a large number of stand visitors, including the chaps from Harken !! Lets see what you think…?? We’ve published photos before of the inverted jammer on Charles Apthorp’s boat…..
Phil Evans Seen Using Acupuncture to Boost Performance….!! Now before you all get excited by the look of the muscles on a triple world champion (! ), look closely !!!! This note from Steve this morning…. Ingrid has been working overtime on both Ashley Smith and Phil. Yesterday Phil woke up almost unable to walk. We thought we would not be able to sail. After acupuncture during breakfast all was well. Have you ever cursed and sworn, even gently, as you try to tie the knot in the mast ram string in exactly the right place??? Or bumped your head doing it?!?! Well how about this very neat arrangement….?? (Double click photo to enlarge) The line has to be tapered and a soft loop spliced in the end. 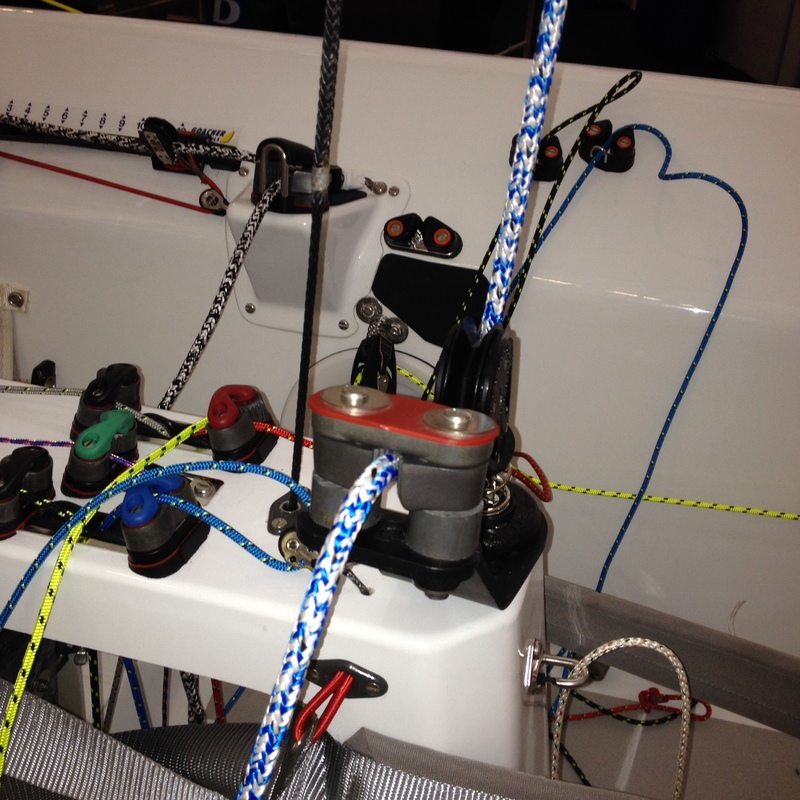 Then you just need a button on the mast ram arm to slip the loop over. First time right, every time. This idea was seen on a boat finished by Phil Evans. 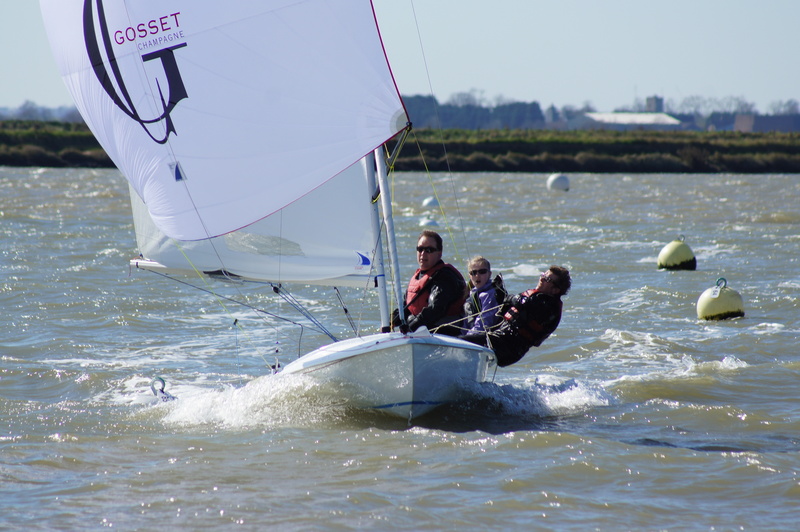 The Flat FF Console – Michael Thompson Experience…..
For interest, I have sailed one of Phil Evans boats with a “flat” console for 5 years and have found it very easy to use. Adjustments are easy to make, even in a blow. It is possible to sit on the console but that doesn’t usually happen. If you happen to land on it by mistake it isn’t so uncomfortable as a bunch of cleats. We have not found it necessary to make any changes. Where should the Heavy Metal Go???….. The lead goes in the middle, right? It keeps the “ends light” is the idea. I must have a climb around a modern P&B boat though for I am told that this principle does not apply laterally across the boat. Alan apparently fits metal strengthening behind the jib tracks, inside the side tanks. Interesting – so is this about pitching, yawing and rolling moments?? You can see the logic though, can’t you? 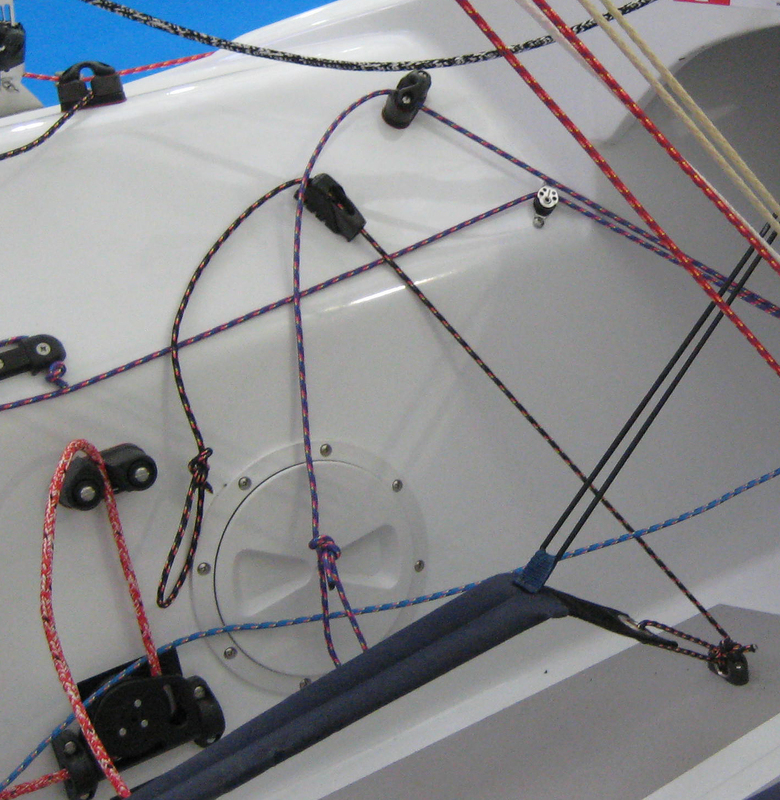 You bring lateral stability to the boat by pushing the weight away from the centre, thus increasing the rolling moment. I guess it is the same logic as the helm and the bowman sitting opposite sides of the boat on a broad reach. Our correctors now have to be visible and stamped with their weight. Phil Evans slaps his lead under the console and very central. All of it. You may have read that Charles and Gavin’s boat has recesses in the double floor to even keep the lead weight as low as possible in the boat – and Charles tells me he can feel the difference (blimey!). So I suppose I was quite surprised that the New Ovington Deck Mould did not follow suit. 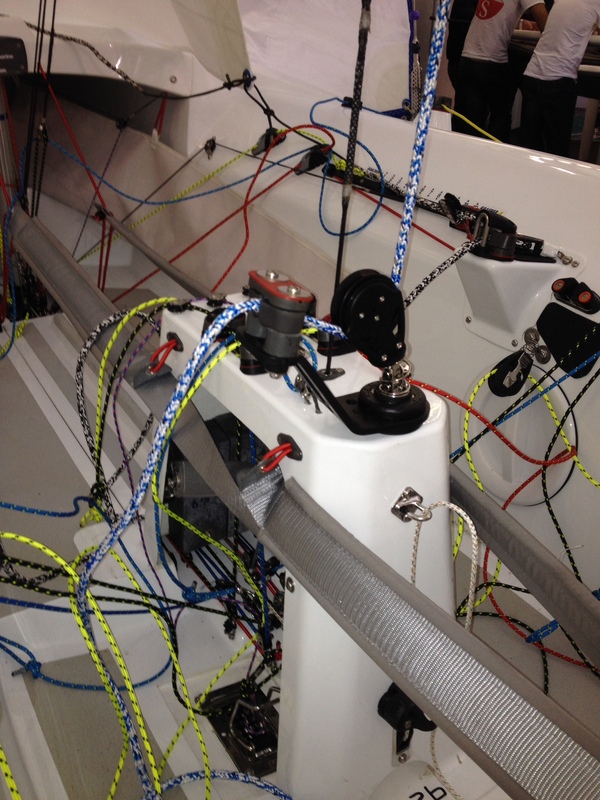 I think Phil Evans did something about this on Geoff Bayliss’ carbon boat. I think under the tunnel cover, Phil created two boxes in the floor right there to take the visible lead – low down and right over the keel. Interesting. Standard one day, I’ll bet…. The Stand at the Dinghy Show was graced by the new carbon boat that Phil Evans has put together for Chris Waples. Phil is still fitting his superby engineered console which gives you 360 degree coverage of key controls from around the cockpit. We’ve had it on our last two fifteens and it works superbly. You will see in the photo (click to enlarge) that Phil now has an extra line coming up the front of the console. It uses the same self cleating principle. It’s the cunningham control. Previously sited on the forward port cleat, this location is now taken by a single line which controls both jib cars. (Yellow line) Very neat…. 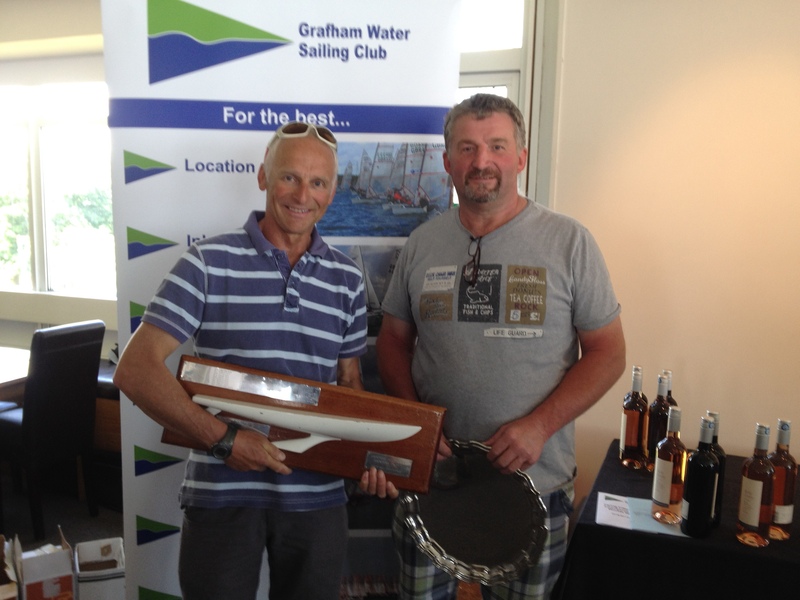 At the Datchet Open, we were fortunate to have the Waples Wines Dynasty roll up with their family two boat race program. Pretty daunting….Waples Wines, famous for their generous sponsorship of the Northern Travellers Series – and stylish spinnakers – are great to see at any time, but what caught my eye obviously was the new boat that Chris and Tom were sailing. It’s the first out of the new Ovington deck mould and superbly completed in rapid order for the Dinghy Show by Phil Evans. So what’s new with the new deck mould? Almost unseen to the naked eye is that the aft bulkhead has been flattened out to make fitting the rear hatch cover easier. Difficult to see with the naked eye actually, but on the first Mk X deck it was slightly dished. Well, the most obvious and controversial thing was the smooth (non textured) deck surfaces. Chris and Tom’s boat looked stunning because they had the remaining non slip deck surfaces painted by Ovi in a silvery grey. It looked frankly sensational (see photo). They elected to still have a non slip panel down the centre of the foredeck, so this was in silver grey along with the top of the side tanks. Everything else was bright white. This reminded me though of two things. One is when I called the late Dave Ovington about 20 years ago when I moved into Fifteens. “I’ll have grey non slip decks, Dave”, I said. There was a sharp intake of breath at the other end of the phone…..
“Think about the weight. That’s 2kg of paint right there”, said Dave. “It’s not all in the centre though, is it?”, says Dave. Hmmmm…. the second thing was that I was disappointed to learn recently that the purists are going for plain white hulls to save from the weight of waterlines distributing the weight. Hmmmm…. Well – I think I vote with Chris and Tom. And I have two waterlines on mine…..!! 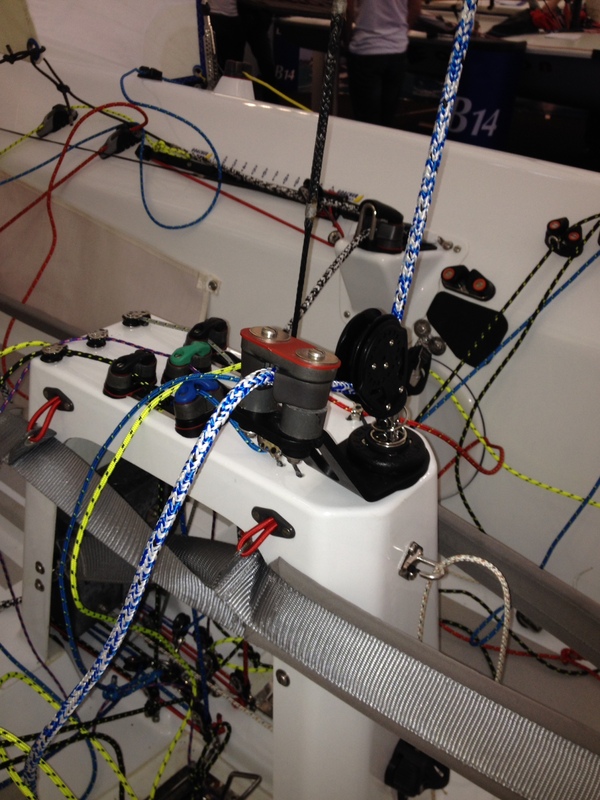 Phil Evans Speaks on Carbon Flying Fifteens…..
Last week, there was a web posting about the main console in a Phil Evans boat. To complete the picture (almost), you need to see the sidetank controls that nestle between the helm and crew amidships. In the photo (double click to see it larger), the stern is to the right of the photo. The purple line on the side tank is the kicker, and the black line is the mast ram. It so happens that the spinnaker sheet in this boat is also black, but you can probably tell that this emerges around the ratchet block that you see here. The genoa sheet turret is pretty simple – and being hollowed out gives somewhere for the jibcar return shockcord to live, tucked out of harm’s way…. hopefully. 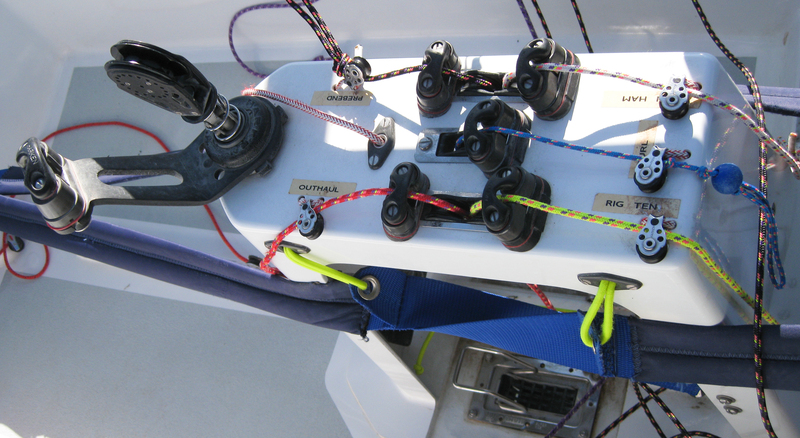 Flying Fifteen – Phil Evans Console…..
Down south, the predominant “brand” or source of Flying Fifteens has got to be P&B. We had an item on the blog last week showing what the P&B and Brett Dingwall consoles looked like. Well – here is the other main P&B alternative – the Phil Evans Console. Phil has a special flat topped console made for his boats by Ovington – it’s a little wider I would guess than the console in a P&B boat. For a size 11 foot like mine, there is a consideration associated with that. This is basically the same console design dating back to Steve and Phil’s original World Champion winner. 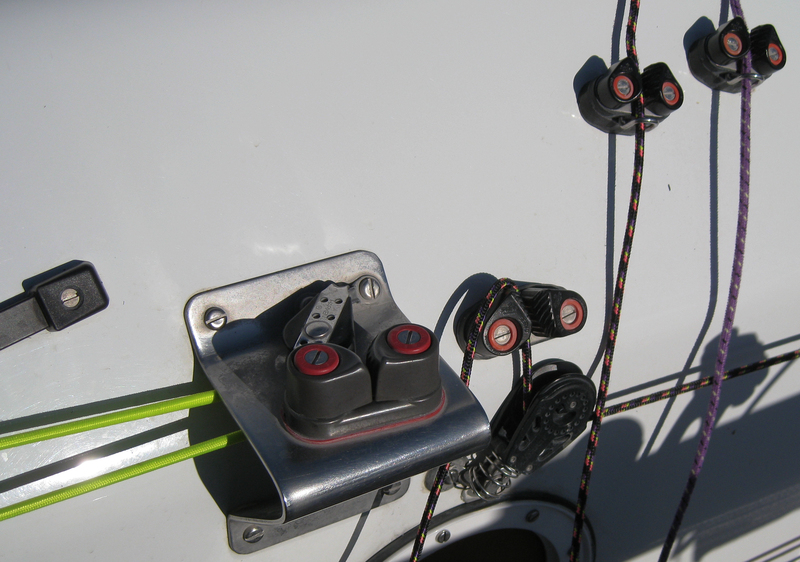 You can pull these control lines from anywhere in the boat and from just about any angle – and they self cleat. Very neat and very clever. 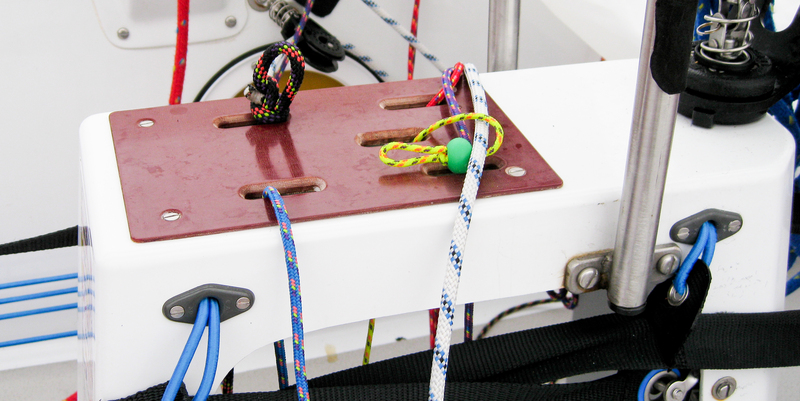 The pink and white line that is flopped over the back in this photo is the strop for the mainsheet floating block. 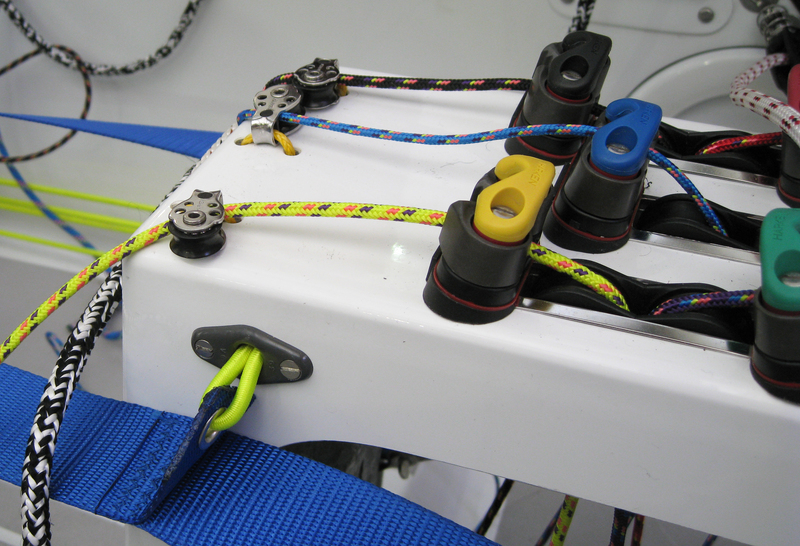 Then the other control lines are – blue (furler), red (outhaul), white (cunningham), yellow (rig tension), black (pre-bend). Both P&B and Evans’ are good. I must admit, having tried both this design is pretty much to my preference….. The Ovington Flying Fifteen at The Dinghy Show caused quite a bit of interest in our Bar – possibly only out-commented by the superb state of Keith Jamieson’s boat….! There were lots of challenging design and finishing touches on the Ovi that made your head engage. It seemed to me though that in the forward control area they ever so slightly may have run out of time, or inspiration – or something. You can see a picture of it on the left here. At first glance it looks OK, doesn’t it?? Well I would agree, and I’m sure it is completely serviceable. Take a look at this though. This is the forward control panel in a Phil Evans boat. 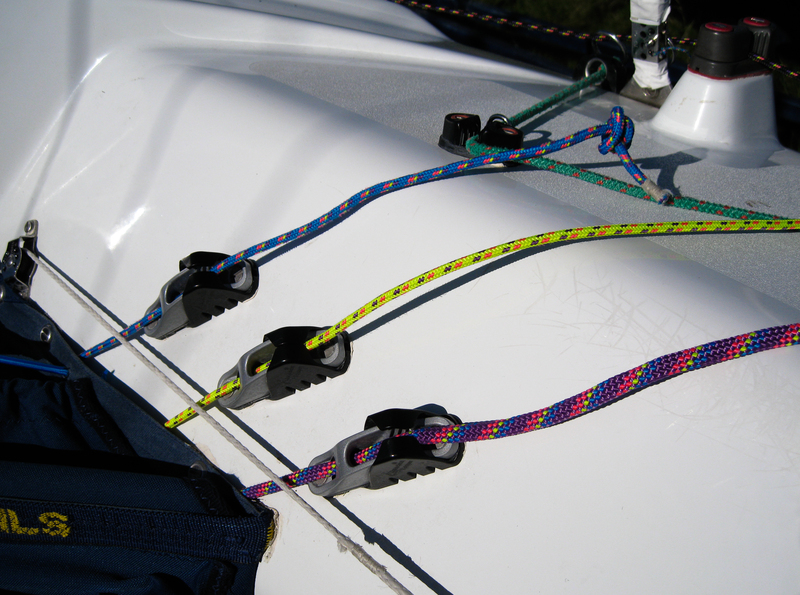 Those clam cleats with the snap locks are excellent for the job in this area – and nothing will jump out unintentionally. 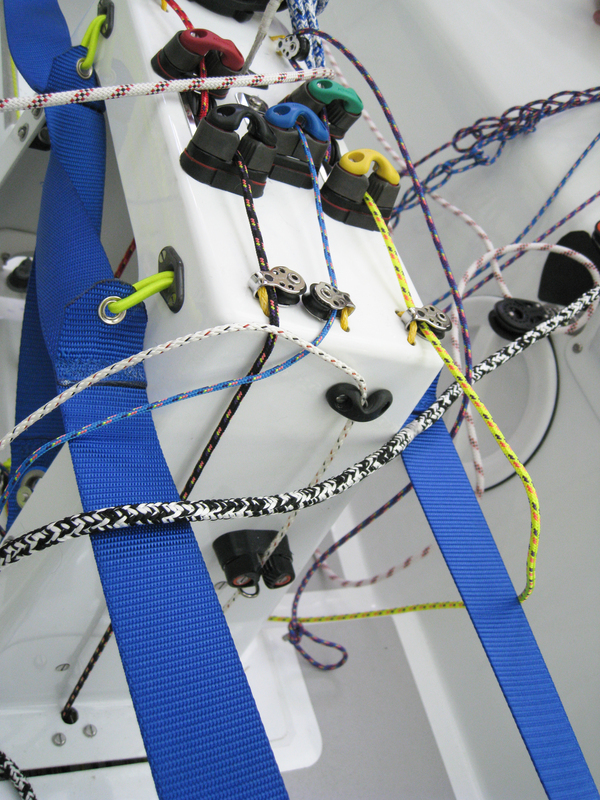 The blue line is for the pole uphaul, the yellow for the co-ordinated jibcars, and the purple line for the forward toe-strap adjusters. The white line that you see running fore and aft is the control line leading to the jib cars. 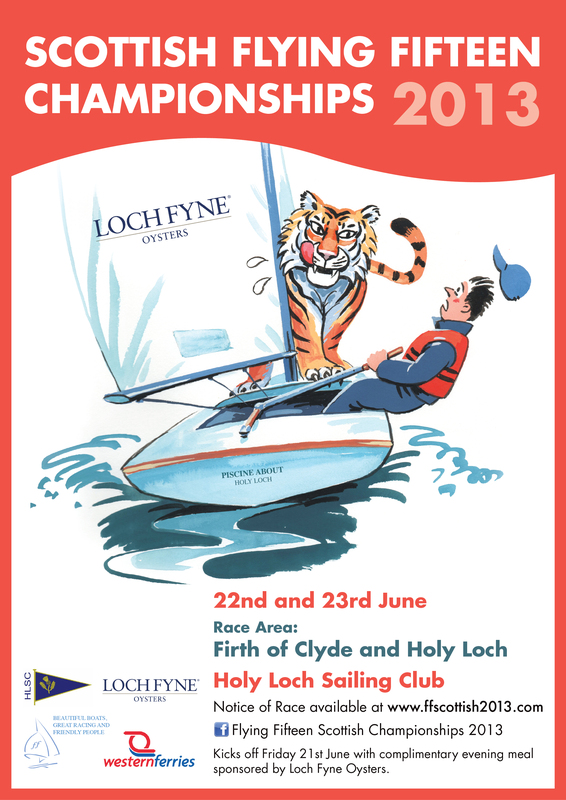 Flying Fifteen – Phil Evans Spinnaker Hoist…. 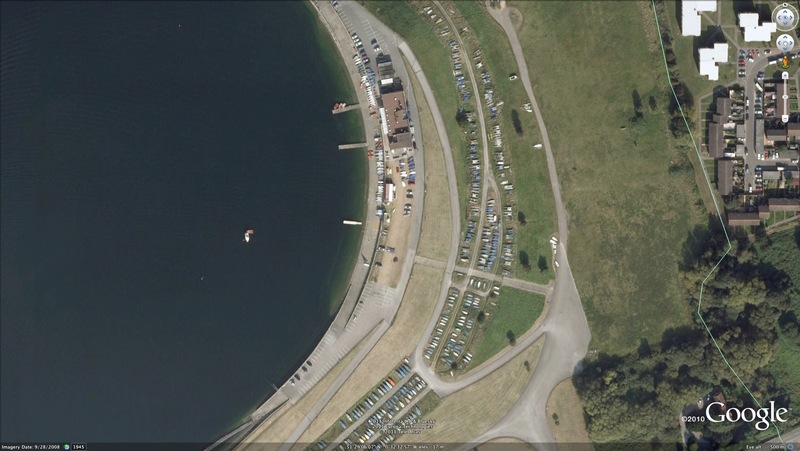 A few days ago (see March 22nd), we wrote about the spinnaker hoist on the Ovington Fifteen at the Boat Show. The VC has kindly dug out a couple of photos, of 3644 I think, to show how Phil Evans arranges his spinnaker hoist. 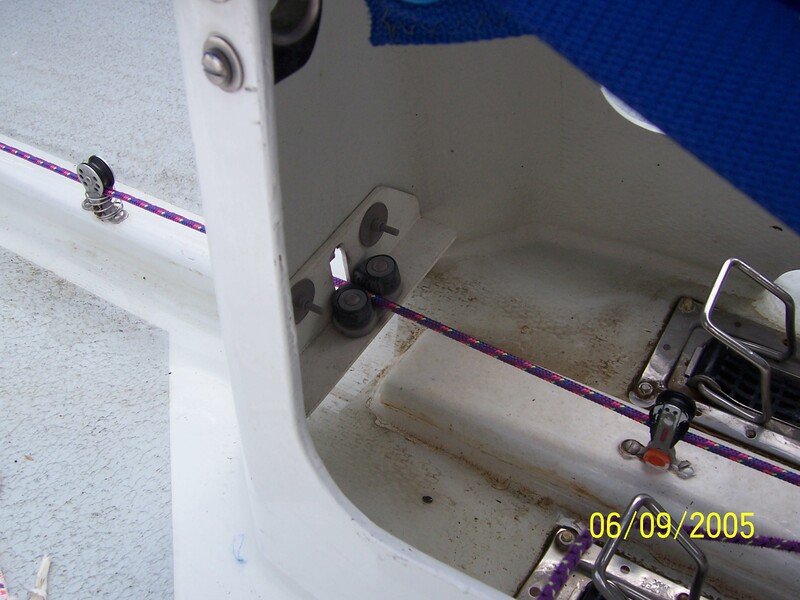 You will see that the cleat is hidden away on a little platform out of harm’s way under the console – and therefore out of sight. Note the feeder block a few inches forward. 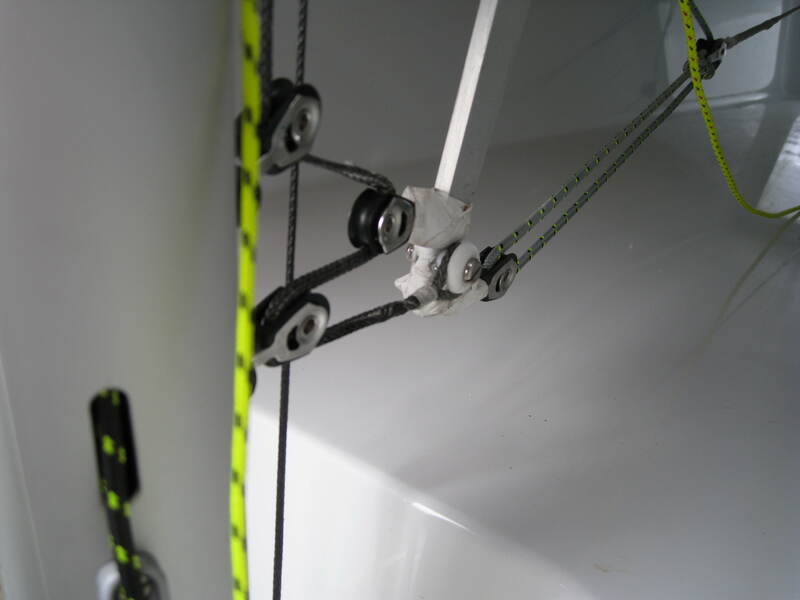 Then behind the console you have a sprung loaded turning block that automatically loads the cleat while hoisting and can be pulled from any angle. 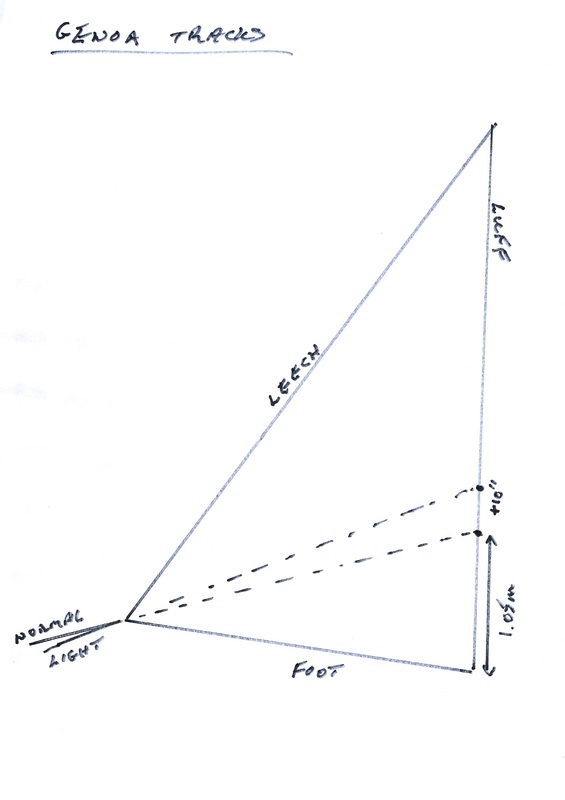 I’m sure Phil would say too that a terribly marginal benefit relative to the Ovi cleat would be better concentration of weight towards the keel. Downsides? – you cant see the cleat if anything goes wrong, like a cam jamming open. But how often does that happen? 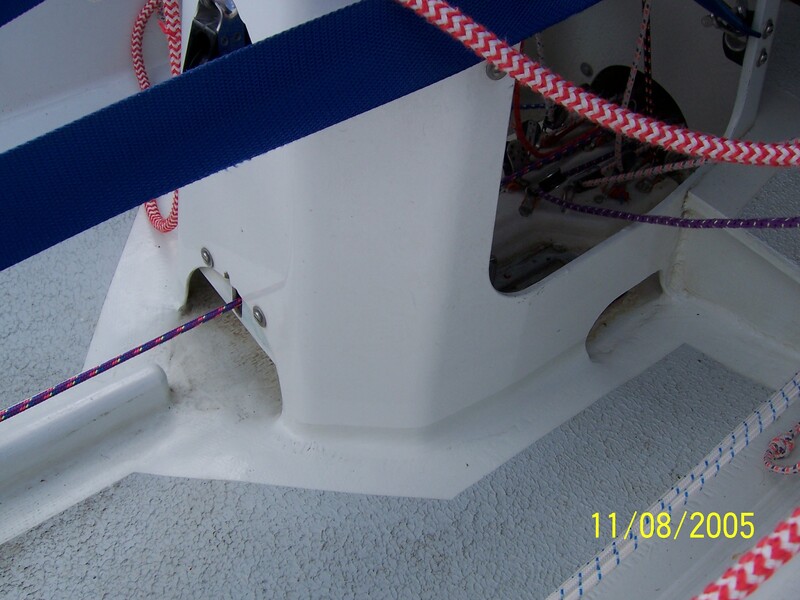 You might also be just able to see in the top photo that a few hundred races on that boat has worn a groove in the console where the halyard rubs upon release – a small problem though….